Jane Powell, Techsil, explains how to choose the right adhesive when bonding elastomeric materials in medical devices. Elastomeric is a term given to materials that elastically return to their original shape after deformation by compression or tension. Materials fitting this category are numerous and include rubbers, plastics and polymers; all differ in their polymer structure, polarity, and surface properties and that is why it is so difficult to stick these materials together. The growing number of design applications for elastomeric substrates has greatly increased the need for information on assembly techniques using these materials. Adhesives offer several benefits over mechanical fasteners for joining elastomeric materials. Unlike solvent bonds or ultrasonic welds, adhesives perform well with thermoset rubbers. In addition, adhesives distribute stress over a joint's entire bond area rather than in a single location. Unfortunately, the wide selection of elastomers and adhesives can make it difficult to identify the optimal combination for a given design. What makes elastomeric materials so difficult to bond? 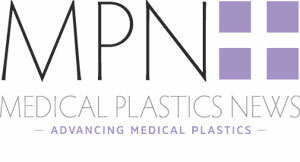 Many modern elastomeric materials used in the medical field are formulated specifically for their resistance to harsh chemical and environmental conditions. As a result, these substrates also tend to be difficult to chemically bond. Often characterised by low surface energies, low porosity and non-polar surfaces, elastomeric materials feature no surface roughness onto which an adhesive can secure itself. In addition to this they are stretchy! So what properties are important to consider when choosing an adhesive to bond elastomeric materials? Must the adhesive provide an elastic bond once cured to prevent stress cracking? Does the adhesive need to withstand conventional sterilisation methods with no deterioration in the properties of the bond? If the bond will be in contact with water, heat or other environmental conditions will the adhesive be durable? Does the bond need to be invisible? Does the adhesive need to be viscous to fill a gap? How is the adhesive going to be applied; by hand or fast speed automated process? How big is the area to be bonded? Will the adhesive need to bond to other substrates? Does the adhesive need to have a particular bond strength, colour or cure speed? Cyanoacrylates: One-part, solvent free, rapid room temperature curing adhesives. They adhere to most substrates, are easy to dispense in automated systems and come in a range of viscosities. They exhibit strong shear and tensile strength. Whilst cyanoacrylates offer an easy bonding solution, they do have decisive drawbacks: They embrittle quickly and exhibit a very low impact and peel strength. They show poor durability on glass and poor solvent resistance. They are not good gap fillers, have low temperature resistance, the bond skins quickly and may stress crack some plastics. In addition, cyanoacrylates do not allow time to re-align the joints due to curing in seconds and cannot extend over large areas (they will bond the spreader or roller). RTV Silicone Adhesives: Solvent free, one-part systems which range in viscosity from self-levelling liquids to non-slumping pastes for gap filling. They cure to soft, flexible thermoset elastomers with excellent property retention over a wide temperature range. They adhere to a variety of substrates and there are UV cure formulations available to initiate cure. However, some can be slow to cure, so they are not always practical for small item assembly on a fast production line. They can have poor cohesive strength and a limited depth of cure. Light Curing Acrylics: Cure within seconds to form a tough thermoset polymer with excellent adhesion to a variety of substrates. The ability to cure ‘on demand’ offers significant processing benefits. In addition, the range of viscosities and properties make light curing acrylics ideally suited for fast speed automated bonding processes. Other advantages include: Good environmental resistance; solvent-free; good gap filling; 1-part; invisible bond lines; rapid fixture and complete cure; the bond formed is elastic, so there is no stress cracking and they can be sterilised without losing integrity. Drawbacks are minimal: light must be able to reach the bond line for cure and light source equipment must be purchased. Because the final resins are thermoset plastics, light curing acrylics offer enhanced thermal, chemical and environmental resistance over Cyanoacrylate adhesives. which provides the highest bond strength. Other factors such as speed of cure, flexibility, environmental resistance, thermal resistance, suitability for automation and price will play a large role in determining the optimum adhesive system for a given application.